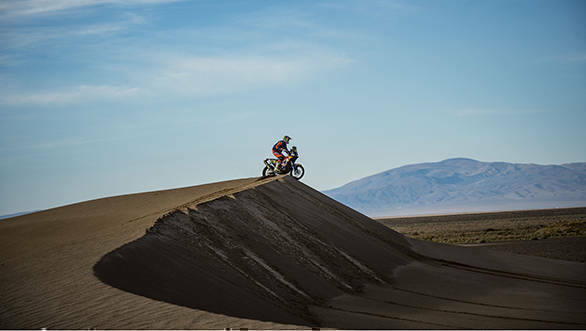 Stage 4 of the 2017 Dakar Rally took participants a total of 521km from San Salvador de Jujuy to Tupiza. While it wasn't the furthest they've travelled, the stage did have the longest competitive section yet, measuring 416km. The stage is set in the high altitudes leading up to the Bolivian Altiplano, and the terrain in the first half comprised of loose sand and then fine dust. It was a challenging one that shot down the hopes of quite a few competitors that expected to finish this year's rally. Toby Price is one of these competitors, as he was retired from the rally after he suffered a broken left femur in a crash. The Australian rider, racing for Red Bull KTM fell 371km into the stage and had to be airlifted to a hospital. This means there will be a new winner in the Bike category this year. 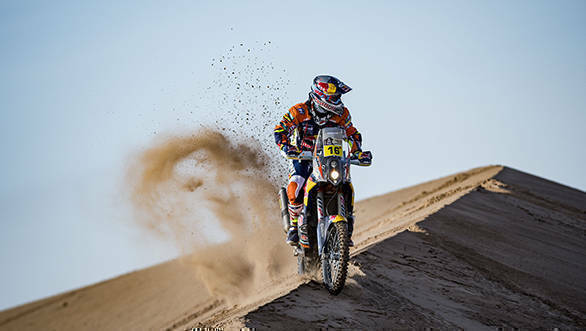 Leading this category after finishing fourth in Stage 4 is Pablo Quintanilla, 2m07s ahead of Red Bull KTM's Matthias Walkner. Walkner won the stage with a total time of 4hr57m22s, while Xavier De Soultrait took second with 4hr03m20s on the clock. Stefan Svitko finished in 3rd place, 8m33s behind him. Svitko is currently third in the overall standings, 5m52s behind Quintanilla. The Car category had its fair share of drop outs too. 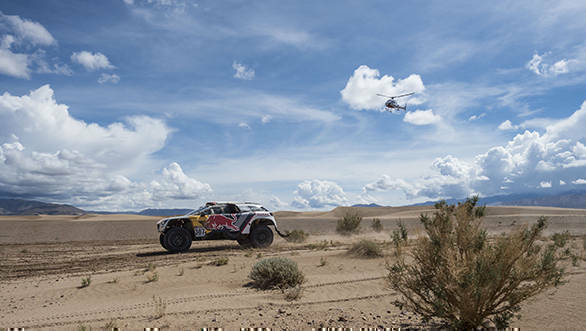 Nasser Al-Attiyah, who suffered a mechanical failure in Stage 3, lost any chance he had at winning the title after he fell around 2hr15m behind the then rally leader, Sebastien Loeb. Under those circumstances, the team decided to withdraw Al-Attiyah from the 2017 Dakar, before the start of Stage 4. Team Peugeot Total's Carlos Sainz faced some tough luck too after rolled his car into a ravine where he was stuck for two hours. He eventually managed to get back on the road, only to finish 2hr19m behind stage leader and team-mate, Cyril Despres. Despres took the stage win with a time of 4hr22m55s, 10m51s ahead of Mikko Hirvonen. Team Overdrive Toyota's Nani Roma took third place (4hr35m46s) while Stephane Peterhansel took fourth (4hr38m10s). Loeb took fifth, 22m13s behind Despres, despite losing around half an hour owing to engine issues he faced with his Peugeot 3008 DKR. Despres now leads the overall standings by 4m08s, while Peterhansel and Hirvonen are second and third respectively. Ignacio Casale dropped to second overall in the Quad category after his 9th place finish in the stage. Sergey Karyakin now leads the category by just 28s, after finishing second in the stage behind Walter Nosiglia. Meanwhile in the Truck category, defending champion Gerard De Rooy won the stage by a close 30s ahead of Airat Mardeev, and climbed up to fifth in the overall standings. Dmitry Sotnikov leads the category by 1m55s, ahead of Federico Villagra, while Eduard Nikolev stands at third.